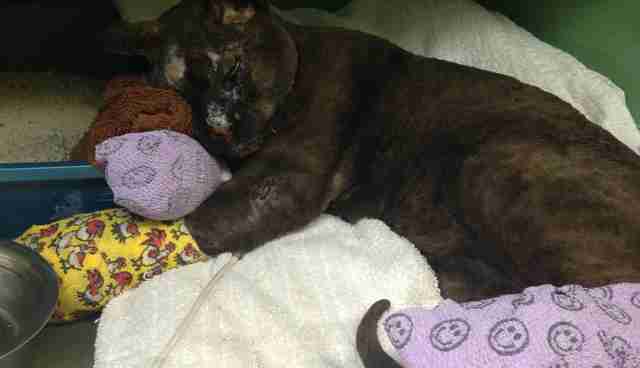 Memow is recovering at Ballard Animal Hospital after barely escaping from a devastating fire that destroyed his home. Memow shared an RV with a young female cat, a young dog, and his two humans. In the early morning hours of Feb. 24, a fire broke out in his RV which was parked in the Ballard neighborhood of Seattle, WA. Fortunately, both humans escaped with minor burn injuries as well as the dog. 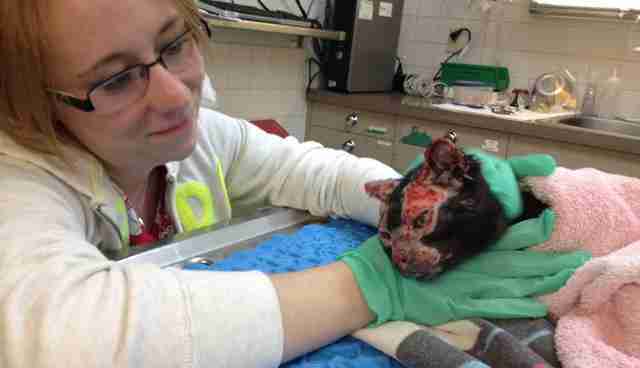 Memow escaped, but was badly burned on his face and all of his feet. ( Video of the fire shows the cat running from the RV) Sadly, it is unknown if the female cat escaped or perished in the fire. As of today, she has not been seen. Memow's road to recovery began the next morning when a good Samaritan spotted him in the road. The man noticed a mob of crows dive bombing the cat and realized he was injured. He quickly made it to nearby Ballard Animal Hospital and alerted staff. 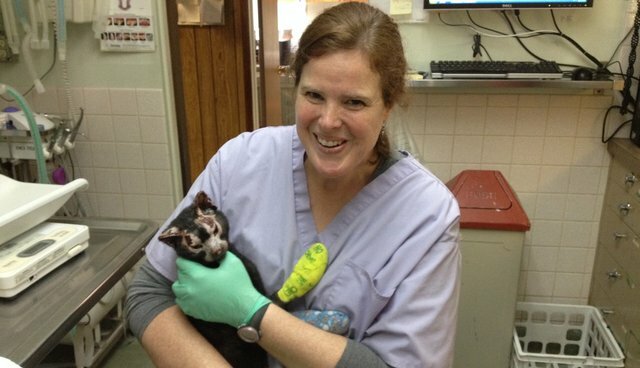 A hospital employee found the kitty in the road, crying; he was helpless to defend himself as his eyes were swollen shut from severe burns to his face. He was transported to Ballard Animal Hospital and the staff quickly moved to stabilize him. He was started on IV fluids, pain medication, and antibiotics. 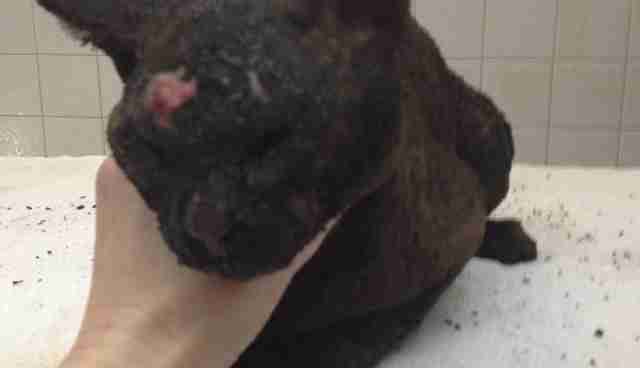 His severely burned paws were wrapped in burn cream and bandages. Later, after he became more comfortable, soot and charred hairs were gently cleaned from the remainder of his body. Medication was applied to his tongue which was badly burned. Hospital staff eventually determined the cat must have been in the nearby fire the night before. They learned the people involved in the fire were taken to Harborview Medical Center for their burns. The kitty's people contacted Ballard Animal Hospital several days later. It was then that staff learned the kitty's name and age (a young five-month old) and how dearly he was loved. Memow's people lost everything in the fire and were not local to the Seattle area. Memow has been at Ballard Animal Hospital for over a month now. Every day he gets stronger. His paws are still wrapped from the severe burns, but he is healing well. He is even starting to grow his whiskers back! A "Go Fund Me" page was set up to cover his medical expenses. So far, all expenses have been paid by the generous support of many caring individuals donating through the "Go Fund Me" site. Memow's recovery will probably take another several months. He has a visit with a surgeon this week to check the progress of his healing paws and an appointment with an ophthalmologist in several weeks to check his eyes. Staff at Ballard Animal Hospital are deeply touched by all the community support and are hoping for a quick and full recovery for Memow. To follow Memow's story please visit the Ballard Animal Hospital Facebook Page.